After being on the volunteer email list for far too long, I finally committed to showing up. Luck would have it that we’d be “finishing” the Pope to Putah Creek trail near Lake Berryessa. Led by Bam Bam, the crew was a bunch of pros. It was great to meet the people that maintain the greater Bay Area’s trails. Out of the ten volunteers this weekend, at least half of them seemed to volunteer every other weekend. They’re the ones showing up, weekend after weekend, to retread, brush and log-out. I sometimes complain about the condition of trails in places like Ventana. These were the people that work to fix it. Trail building with Tuleyome on the Pope to Putah Creek trail. The Pope Creek to Putah Creek project has been ongoing for at least a few years. Yesterday, we extended the tread all the way to it’s destination. And then, at Putah Creek (flooded by Lake Berryessa), we drank champagne (8 ounces between 10 people) and went for a swim. It’s an interesting trail. Brand new. Remote. Scenic. Backpackable. Not yet really ready. 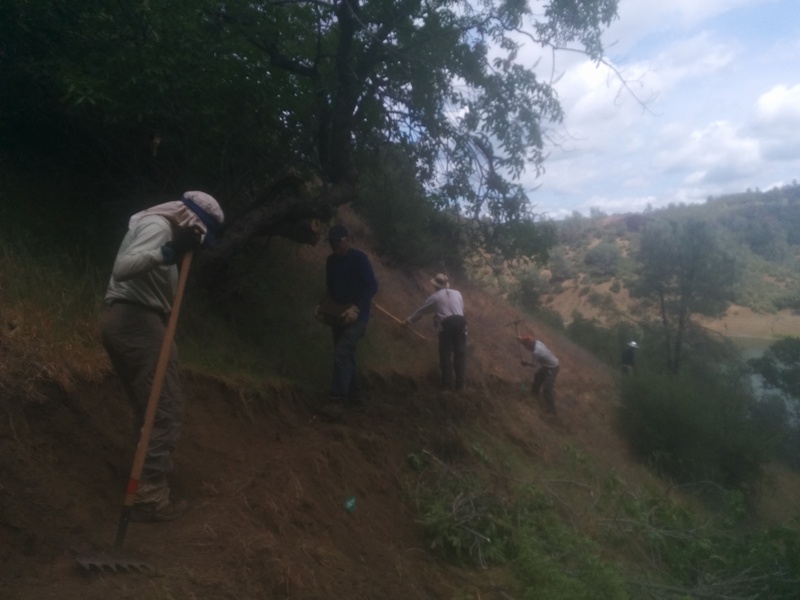 I learned a fair amount about what it takes for volunteers to build new trail. At this point, there’s still quite a bit to do. Widen and re-bench it. Rebuild steep sections. Brush. Sign. In it’s current shape, it’s almost as if it’s disappearing. Some sections are definitely a first hash. Get something on the ground. Break through the brush. Make it to the creek. Props to all who regularly show up to build our trails. It’s an incredible, and important hobby. I had a good time meeting all of you on this stint.